In most parts of the country, people are accustomed to seeing indoor and outdoor no Smoking signs as smoking has been banned in public places due to the health risks it poses to both the smoker and those exposed to the second-hand smoke. More than health risks, smoking today in many cities and states conveys a negative social stigma that is due in part to the bans and prevalent no smoking signs. To smoke in California, for instance, a smoker has to go out of their way to find a place where smoking is permitted. Government no smoking signs are everywhere; it is banned in virtually all indoor places and many outdoor places – beaches, public parks, near schools, college campuses, within 25 feet of building entrances, and much more. The inconvenience of smoking has increased the rate of quitting, according to some reports. By emitting vapor instead of smoke and ash and using electronic cartridges instead of burning actual tobacco, the manufacturers of e-cigarettes claim they are harmless. The deemed “safe,” smoke-free nature of the e-cigarettes, under the thinking of the manufacturers, means e-cig users can therefore “vape” almost anywhere regardless of no smoking signs – movie theaters, work offices, bars, restaurants, parks, malls, and even air planes. The vision of e-cig makers --the freedom to light up and vape anywhere -- has enticing appeal. The FDA has yet to rule on e-cigarettes though it plans to soon. 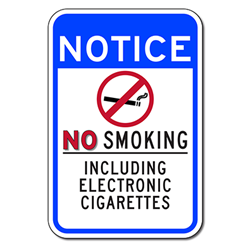 Yet with more and more no smoking signs with the “including e-cigarettes” note, many cities and municipalities are erring on the side of caution. In addition to health worries, others are concerned that e-cigarettes imitate real cigarettes and their use will undo 20-plus years of anti-smoking campaigns. Advocacy groups are concerned that vaping e-cigarettes will lead to smoking real ones. 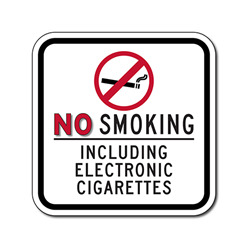 Similar to the ban of candy cigarettes, which emitted a puff of powdered sugar that “looked like” smoke, posting no smoking signs including e-cigarettes may be as much about banning the act of smoking as banning actual e-cigarettes usage.